" Where the Carnival takes place ... "
Visitors and locals scream, sing, shout and dance amid confetti and ribbons. 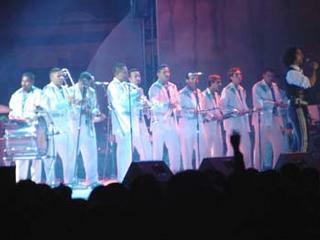 Bands of all kinds play the infectious rhythms of the State of Sinaloa. And the food-oh, the food-camarones (shrimp) prepared in every way possible, washed down with ice cold Pacifico beer, for it's Carnaval Time, Mazatlán's biggest pachanga (fiesta). For seven miles, all along the beachfront Malecón, beginning at Paseo de las Olas Altas, the festivities have been attracting celebrants for over 100 years. 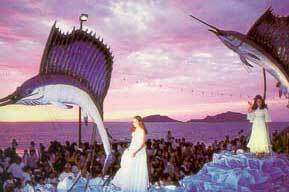 People arrive from all over Mexico and abroad for Carnaval, Mazatlán's celebration of Mardi Gras. Said to be the third largest in the world after those in New Orleans and Rio de Janeiro, Carnaval is this Pacific resort city's most attended annual event, attracting as many as 300,000-400,000 revelers. Since 1897, it has been traditionally held the week before Lent. Like its big sisters in New Orleans and Rio, the celebration offers parades, special shows, and the coronation of La Reina de Carnaval, Queen of Carnaval. The "Carnavaldome" on Avenida. 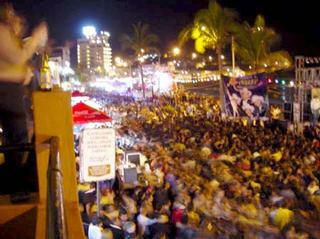 del Mar on Playa Norte, north of town, is the primary focus of the street action. This temporary assortment of stages and booths features continuous music--tropicale, mariachi, rock, and norteña--food vendors, outrageous costume-wearing, and all-night dancing throughout the festival. Avenida del Mar is also the site of two fireworks displays, the traditional castillo--a castle-like fireworks platform unique to Mexico-on Saturday night, and an offshore fireworks finale representing a mock naval battle, in commemoration of Mazatlán's 1864 victory over the French Navy, on Sunday night. The main events kick off the Friday evening before Shrove Tuesday with the juegos florales, or "floral games" in the city baseball stadium. During this well-attended event, a Flower Queen is crowned and literary awards are bestowed upon contestants who have written the best "flowery verse." Top prize is the prestigious Clemencia Isaura Poetry Award, a 68-year tradition that honors the best unpublished work from anywhere in Mexico. 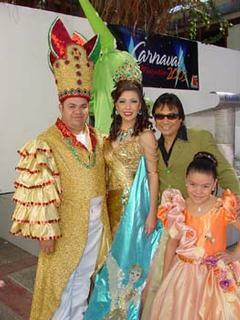 Saturday evening activities begin with the coronation of the Carnaval Queen and El Rey Feo, or "Ugly King" at the Estadio Teodoro Mariscal an event that usually includes concert performances by major Latin artists. 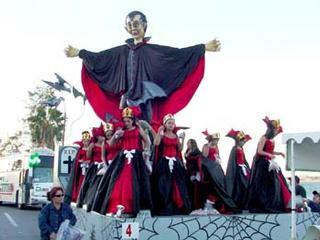 This is followed by the Quema de Mal Humor, or "Burning of Bad Humor," in which an effigy, usually modeled after an unpopular politician of the day, is hanged and burned. Sunday is the biggest Camavaldome night, while the Monday following the weekend is El Día del Marido Oprimido the "Day of the Oppressed Husband," in which married men are to be allowed 23 ½ hours of freedom to do whatever they wish. Two large costume parades, one on Sunday at 6 p.m. and the other on Tuesday at 4 p.m., feature dozens of floats representing various mythological figures from Aladdin to Zeus, plus the newly crowned Carnaval "royalty." 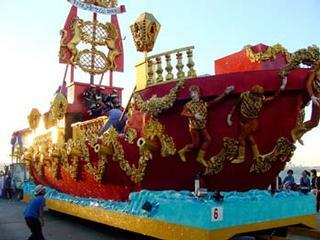 Originally, spectators threw rocks and sticks at the floats, and then switched to seashells. But with the apparent danger to the float riders, the town fathers ruled that now only confetti should be thrown. Tambora sinaloense bands come from all around the state to participate in the parades, which may feature as many as 10 tambora ensembles per day. And every night from Thursday to Tuesday, music fills the Malecón (ocean-side promenade) running along Olas Altas Beach downtown. Roving mariachi bands, the local traditional bandas sinaloenses with lots of brass, and rock bands set up along the way provide plenty of entertainment for the happy, milling crowd, which increases each day until Tuesday night when the Malecón is packed with musicians, dancers and those seeking a good time. At the turn of the century, Plazuela Machado was the central focus of Carnaval. Now that the plaza area is the center of Mazatlán's downtown restoration, Carnaval activities have returned once again, but this time with a gastronomic fair held every evening Friday through Tuesday. Prominent dishes on hand include Mazatlán's famous pescado zarandeado (barbecued fish), camarones con mango (mango shrimp) and marlín ahumada (smoked marlin) and lots of ice cold Pacifico beer. 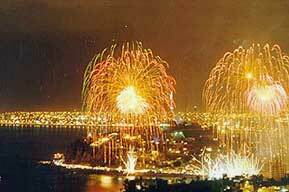 The traditional fireworks display above Mazatlan's coast.